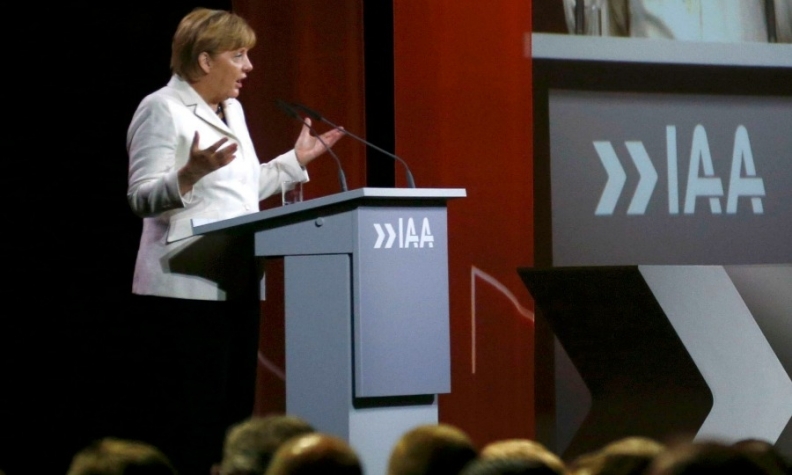 Merkel has been a staunch supporter of the German auto industry. She is pictured at the Frankfurt auto show. BERLIN -- Multi-million euro bonuses paid to German car company executives are not fair given the sector's tarnished image after Volkswagen Group's emissions scandal, Chancellor Angela Merkel said. "No, I don't think this is fair. I don't know how the automotive industry is going to respond," Merkel told mass-selling Bild newspaper in an interview broadcast live online. She added: "They have supervisory boards on which union representatives sit and I think there should be a more sensitive approach (to executive bonuses)." But Merkel, who is standing for re-election next month, said it was not up to politicians to cap executive pay and bonuses.